Talks, tours, seminars, workshops, DIY building, chopping, cooking, eating: just some of the activities undertaken by artists at a-n’s Assembly events throughout May and June 2017. Here we pull together a collection of images from the events in Margate, Liverpool, Bristol, Newcastle and Leeds. 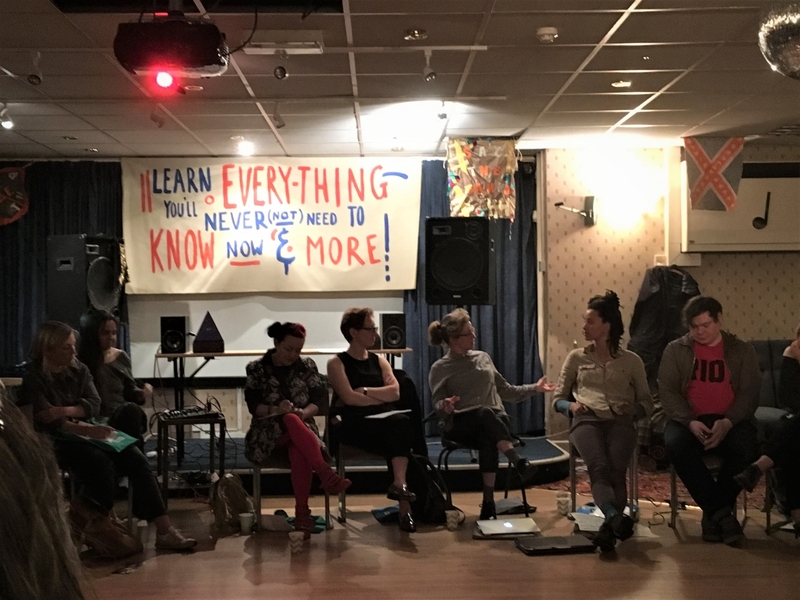 In May and June a-n was out and about in Margate, Liverpool, Bristol, Newcastle and Leeds, bringing together artists for a mixture of workshops, talks and get-togethers. The Assembly programme was developed alongside local artists and artist-focused host organisations resulting in an exciting series of regionally focused events to support a-n’s members and local artist communities. Here, in pictures, we pick some of the highlights from each Assembly event. For Assembly Margate, a programme of eight sessions was devised with Margate-based social artist Dan Thompson. 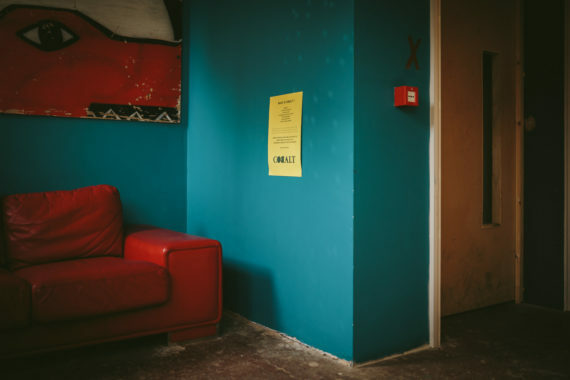 Seminars, workshops, tours and social events took place across a number of venues including Turner Contemporary, photography studio Fire Eye Land, artist-run space STAN Art Pod, Cliffs cafe, as well as Resort Studios and Marine Studios. A seminar entitled ‘The curation process (or – how do I get them to exhibit my work? 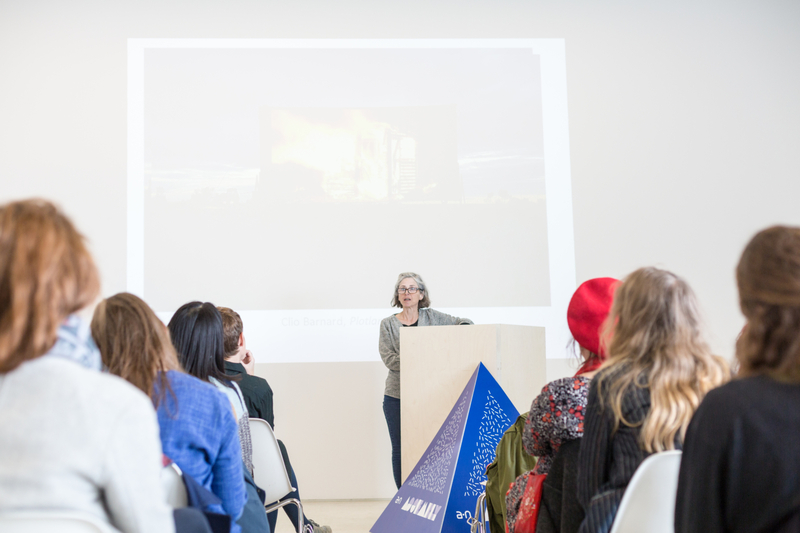 )’ included talks from Turner Contemporary’s Head of Exhibitions Sarah Martin, who reflected on the gallery’s programme, and director of Whitstable Biennale Sue Jones, who discussed commissioning processes. a-n director Jeanie Scott also introduced a-n/AIR’s Exhibition Payment Guidance publication. 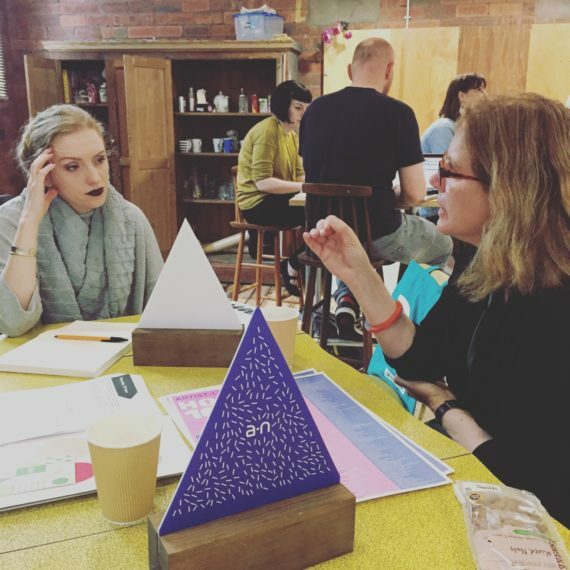 For ‘The power in people’ workshop, AirSpace director and artist Anna Francis introduced her Portland Inn Project – a four-week project of daily activity in Stoke-on-Trent in 2016 – and invited attendees to collectively identify a manifesto for socially engaged practice. 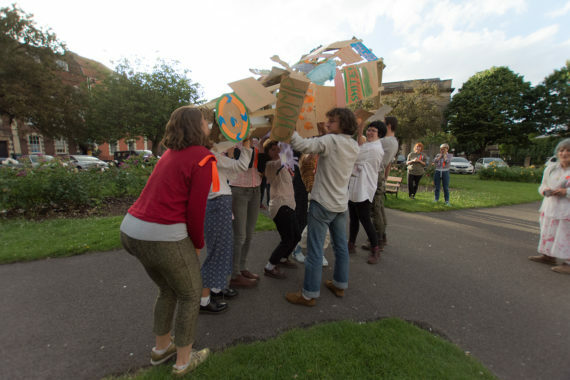 Day two in Margate kicked off with Julia Riddiough’s artist-led tour ‘A Walking Assembly’, which joined the dots between independent artists and arts organisations in the town, revealing its unique arts ecology. Starting at Marine Studios, the tour also visited Crate, Limbo, Bon Volks, Clayspace and Resort. Also on day two, for the ‘Spaces and Places’ seminar hosted by creative hub and studio space Resort, presenters from three arts organisations discussed their approaches to working with artists and communities. 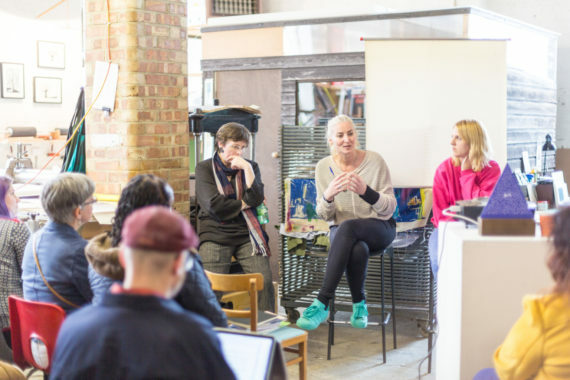 Colette Bailey of Metal focused on its programmes that seek to engage audiences in Liverpool, Southend and Peterborough, Fran Bundey discussed East Street Arts’ temporary spaces projects, and Kate Kneale of HDK explained how it aims to engage communities in Margate. For Assembly Liverpool, a-n worked with Liverpool-based artist Kevin Hunt. The event kicked off with the launch of Hunt’s a-n commissioned Artist-led Hot 100 (version ii). 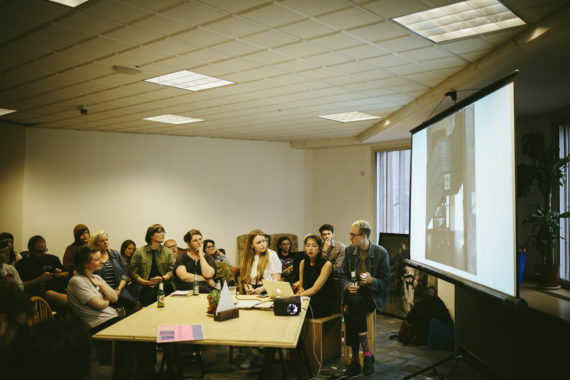 Sticking with this theme, Hunt facilitated ‘People like us – an Artist-led debate’ with presentations and Q&As discussing fresh approaches to nomadic and online artist-led activity. Day two included TÅT: The Liverpool Edition, an online audio-tour of artist-led spaces, active and expired, throughout the city created by Liverpool-based curatorial project Tžužjj. 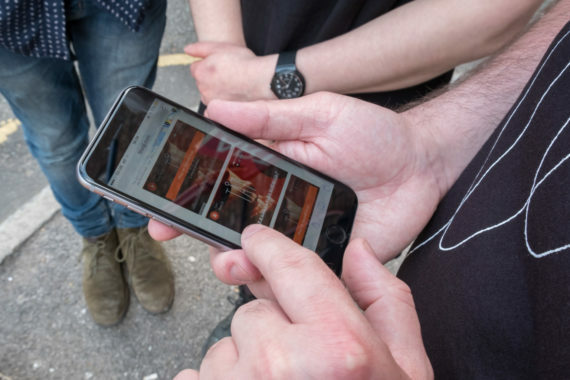 Attendees used smart phones to navigate points on Google maps, with attached Soundcloud clips. The tour is now available on a-n Resources. 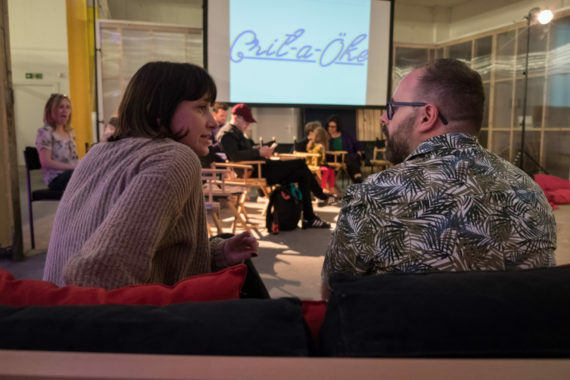 In the evening Tžužjj presented a special edition of ‘Crit-a-Öke’, an event that ‘pushes academic writing through an extroverted medium of Kara-Öke’. Pictured below: Assembly organiser Louise Hargreaves with Kevin Hunt. Assembly Bristol took place as the UK voted in the General Election and learned of its subsequent hung parliament. A well-attended ‘Post-election breakfast’ was held on the morning of Friday 9 June at The Brunswick Club. Kayle Brandon, Louisa Fairclough, Fozia Ismail and Alistair Gentry discussed challenging subjects including diversity, gentrification and gender. Also at The Brunswick Club, spatial-design duo &Sons (Blaise Chatelain and Billy Mason-Watts) presented its first ‘Structures workshop’ event in Bristol. 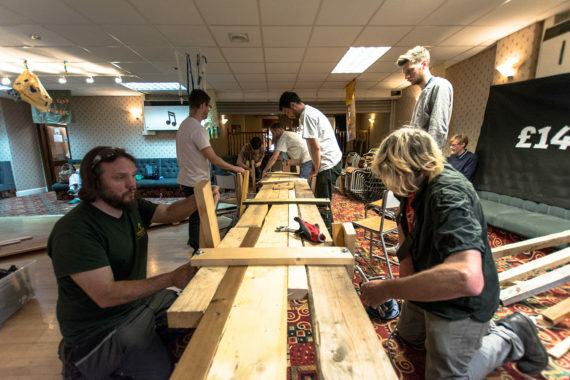 Attendees helped build DIY furniture, a series of tables that later in the day were put to use as they gathered for ‘A feast for the masses’. Other activities in Bristol included ‘Proposal for a Guide for Art Parents – strategies to continue thinking and making as a parent’ which is currently being developed into a new guide for a-n Resources. 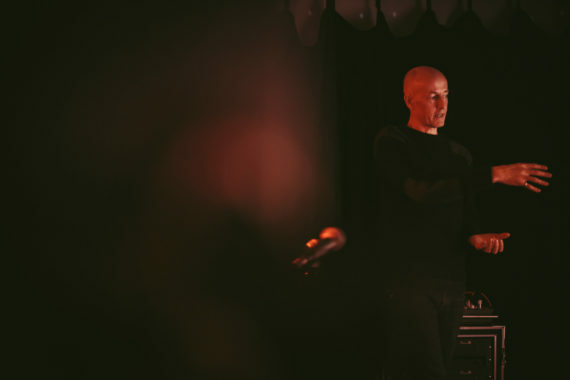 Maurice Carlin, director of Islington Mill and a-n supported Clore Visual Artist Fellow (2016/17) gave a presentation about his work during the ‘Artists, spaces and places’ session at Cobalt Studios. The session included discussion on issues around how artists can better articulate their economic and cultural value, and examined the relationship artists have with the places and communities they inhabit. Environmental artist and director of In-Situ Kerry Morrison also presented, as did Robert Hollands, Professor of Sociology at Newcastle University, and Dr Emma Coffield whose research looks at the relationship between artists and place. The session rounded-off with more informal chat over food and drink, followed by a guided tour of Cobalt Studios. 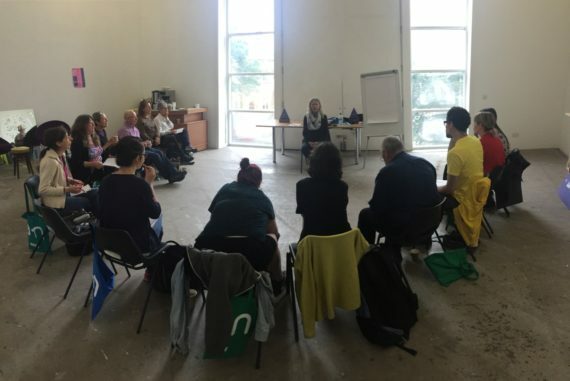 For day two in Newcastle, the session ‘Here and now’ was hosted by The NewBridge Project, in partnership with its Practice Makes Practice programme. 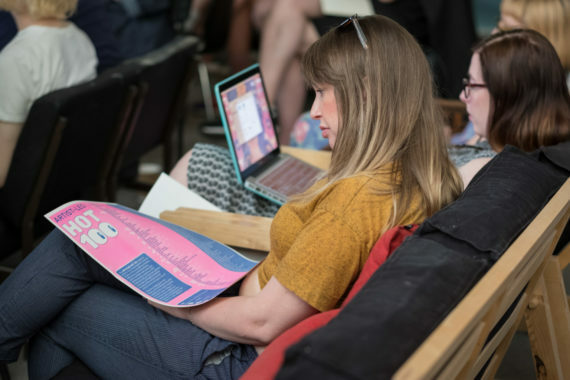 Introduced by the organisation’s director Charlotte Gregory, the session also included a presention by Kevin Hunt, who focused on his research around the Artist-led Hot 100 (version ii) publication. Six artist-led groups then spoke about their projects: Newcastle-based Double Yoke (pictured above), Goldtapped, i o u a e, M I L K, Slugtown, and Middlesbrough-based House of Blah Blah. Day one at Assembly Leeds, organised in collaboration with East Street Arts, started with informal surgery sessions with a-n’s director Jeanie Scott, a-n team member Richard Taylor, Mike McCormack from Hencilla Canworth, and curator Lucy Day (pictured here with artist Zara Worth) discussing how to price artwork. Conversations continued in the afternoon, with breakout sessions during ‘A day on resilience’. Live Art Bistro’s Matthew Allen spoke about the balance between financial and creative sustainability. Artist Ellie Harrison provided advice on avoiding burnout with self-care techniques, when working by yourself or caring for others surrounding your practice. Jon Orlek introduced discussion around blurring life and work, Jack Simpson offered knowledge about working creatively and commercially. The busy sessions culminated in a group meal in ESA’s project space, facilitated by Christie Hill, and chopped, stirred, kneaded and cooked by participants throughout the day as they engaged in informal discussion. Day two in Leeds: the ‘Negotiating with confidence’ session (also presented in Liverpool, Bristol and Newcastle) involved up to 17 participants as Rivca Rubin outlined her expertise in communication and leadership development. 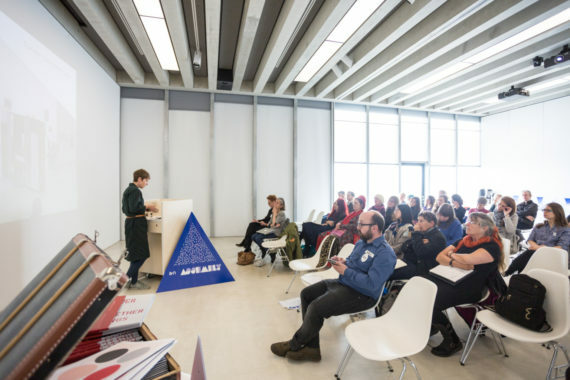 With a key focus on a-n/AIR’s Exhibition Payment Guidance and its four core principles – Transparency, Budgeting, Negotiation, Written Confirmation – the workshop discussed ways in which artists can negotiate confidently when establishing contracts with galleries and arts organisations. With a specific focus on the role of positive language in these negotiations, participants also took into account a-n’s Artist-Led Manifesto. 1. Champ, HEY! TEACHER! – a workshop in methods of alternative education at Assembly Bristol, Thursday 8 June 2017. Photo: Rich Broomhall. 2. Dan Thompson, Instagram post from Assembly Margate, 5 May 2017. 3. Turner Contemporary Head of Exhibitions Sarah Martin, The Curation Process (Or – How do I get them to exhibit my work?) at Turner Contemporary, as part of Assembly Margate. Photo: Jason Pay. 4. Dan Thompson, Instagram post from Assembly Margate, 5 May 2017. Anna Francis’ The Power in People workshop at STAN Art Pod. 5. 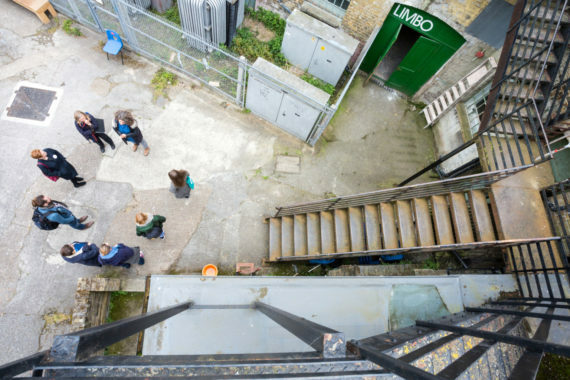 Limbo studios, Margate, Artist-led Tour: A Walking Assembly as part of Assembly Margate. Photo: Jason Pay. 7. Kevin Hunt, Instagram post from Assembly Liverpool, post on 29 May 2017. 8. Kevin Hunt’s Artist-led Hot 100 (version ii), 2017, launched at Assembly Liverpool. Photo: Rachel Brewster. 9. Tžužjj, TÅT – an online audio-tour of artist-led spaces at Assembly Liverpool. Photo: Rachel Brewster. 10. Louise Hargreaves and Kevin Hunt during Tžužjj’s Crit-a-Öke, Assembly Liverpool. Photo: Rachel Brewster. 11. Instagram post of Champ’s HEY! TEACHER! – a workshop in methods of alternative education, at Assembly Bristol. Photo: Rich Broomhall. 12. Post-election breakfast, as part of a-n’s Assembly Bristol. Photo: Rich Broomhall. 13. &Sons, Structures workshop at The Brunswick Club, part of Assembly Bristol. Photo: Rich Broomhall. 14. Maurice Carlin presenting his work during Artists, spaces and places – at Cobalt Studios, part of Assembly Newcastle. Photo: Nigel John. 15. Cobalt Studios, during Assembly Newcastle. Photo: Nigel John. 16. Double Yoke presenting at Assembly Newcastle during Here and now session at The NewBridge Project. Photo: Nigel John. 17. Lucy Day and Zara Worth in conversation at East Street Arts during Assembly Leeds, Thursday 29 June. Photo: Richard Taylor. 18. Instagram post from A day on resilience, East Street Arts, part of Assembly Leeds, Thursday 29 June. Photo: Richard Taylor. 19. Rivca Rubin’s Negotiating with confidence workshop at East Street Arts, part of Assembly Leeds, Friday 30 June. Photo: Richard Taylor. Written to coincide with the launch of the Artist-Led Hot 100 (version ii) as part of Assembly Liverpool, Kevin Hunt’s a-n Resource feature ‘People like us’ explores the nature of temporariness and expiration, morphing and longevity in artist-led initiatives. Not yet an a-n member? Join a-n for full access to this and other Resources including guides, toolkits, contracts and research, plus access to Insurance, Online community, paid work opportunities through Jobs and opps and more.